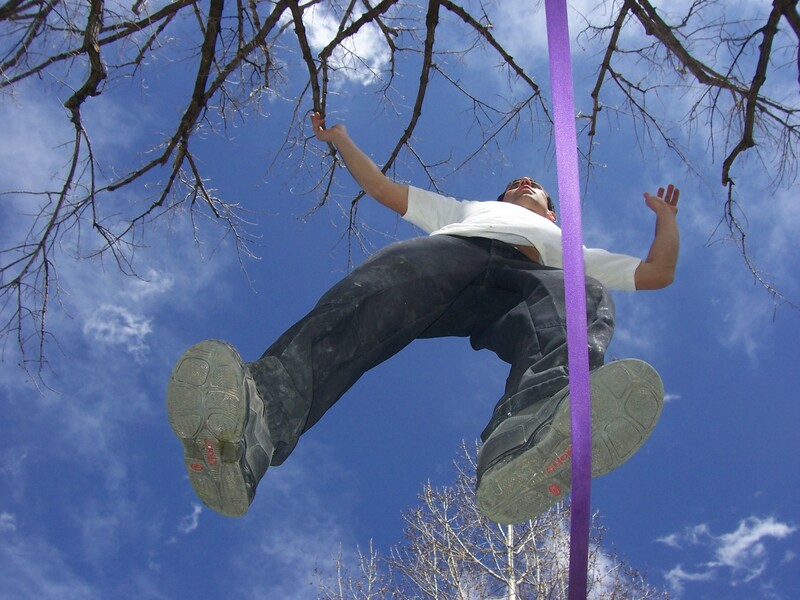 Slacklining is an act of balancing on a narrow piece of webbing that has dynamic movement. Though different forms of tight rope walking have been around for several thousand years, slacklining got its day view in the mid to late 1970s. Most notably by two climbers out of Yosemite in camp 4, Adam Grosowski and Jeff Ellington along with a handful of others started walking on chains and hand rails on their down time from climbing. They soon found that their one inch climbing webbing that they used to make slings with was much more interesting to walk on, thus slacklining was born. From there slacklining has formed into four types, the tradline 1 inch tubular line, usually done between two trees 30 ft apart. Longlining ( Record 1010ft ), highlining ( highest line 3,000ft) and two inch Sport line which is a flat piece of webbing. Over the past several years the two inch sport line has helped to create a new generation of slackliners pushing the sport to new and amazing heights. As slacklining used to be a fun activity to do around camp on their down time or setting one up at the park with friends, it is now becoming well known for its cross-training abilities. With the right combination of form, focus, patience and self confidence any abled body can enjoy the effects that slacklining has on the mind and body. A tradline is short for traditional line, comprised of a tubular or flat one inch piece of webbing stretched between two points, preferably trees. A tradline is anywhere from 15 to 45 ft long, and when walking one feels like a one inch narrow bouncing trampoline. Performing tricks on this one-inch tradline can be very difficult, but with a little patience and lots of practice, anything is possible. The tricks that are performed on a tradline range from yoga, dynamic tricks, to flips and spins. Slacklining is often used as cross training for other athletic activities, with its ability to increase ones reaction time and strengthen the link between the mind and body. Longlining is a very challenging form of slacklining. Stretching a one inch piece of webbing beyond 45 ft could be considered a longline. The longest line to date 1004ft that was walked in Europe. 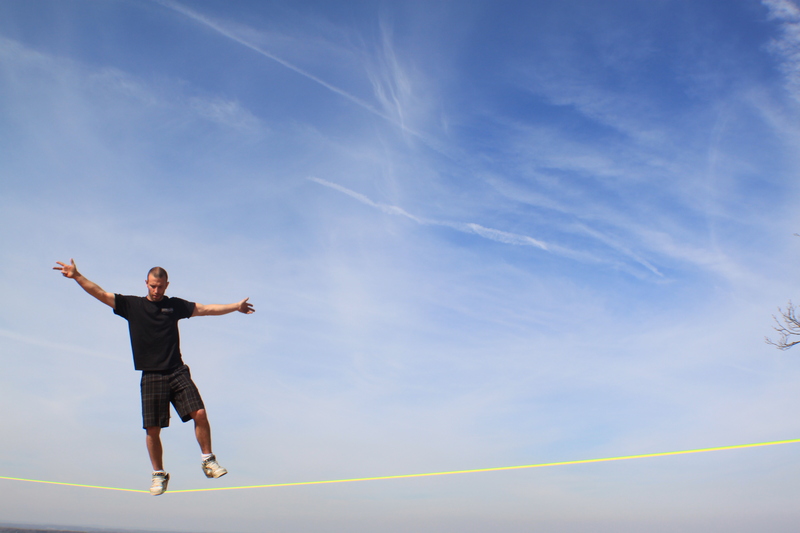 Unlike the slackline which is fairly easy to set up, longlining can be quite complex with how to pull a longline tight. You should take great care and responsibility when Longlining. When done safely longlining can be a very surreal experience. 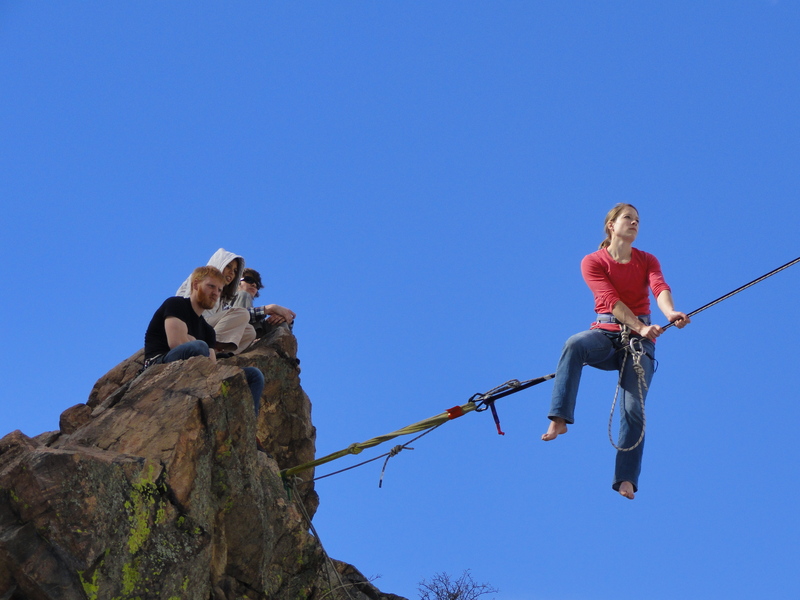 A highline is when you slackline high enough over the ground that one can leash up for safety in the event of a fall.That distance from the ground seems to start at 20 to 25ft. (Always double check the length of your leash, and your lines distance to the ground, so it is high enough that you would not deck if highlining so low) 3,000 ft is the highest line walked and the longest highline walked stretched to 340ft long and over 300ft high was walked by none other than Andy Lewis. Highlining is one of the most exhilarating activity’s that one could do, if given the chance to walk one. The mental control it takes to stand up on a highline let alone putting one foot in front of the other, is something that is hard to explain, to truly under stand this feeling is better explained when the time comes for you to walk a highline yourself. Keep in mind that one should take a lot of time to practice there highline set up on the ground many times over before ever setting it up high. 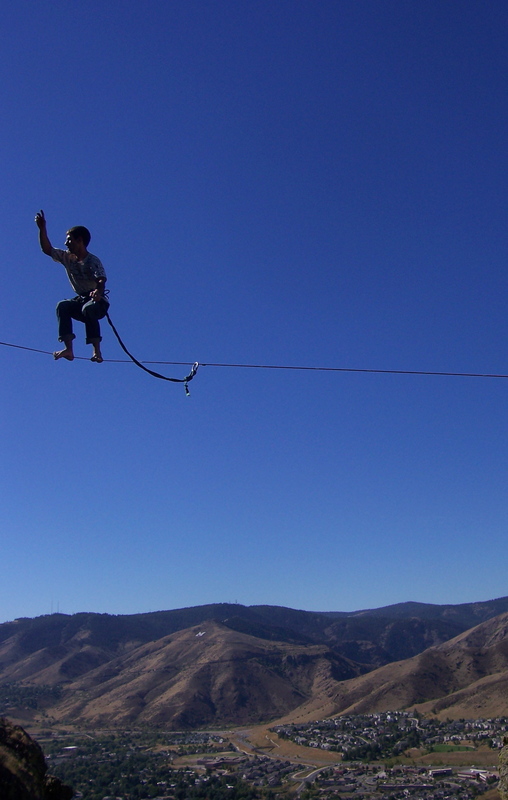 Though respecting all four of the category’s of slacklining, highlining should be the one not to rush into right away. Being reasonable and safe about highlining is an absolute must. Seek out someone in your slackline community that has experience highlining before taking on this task on your own if this is your first time. Sportline is short for a two inch slackline which is made by Gibbon, which are comprised of a two inch flat piece of webbing . Gibbon lines is the sport of slackline compared to the 1 inch slackline which would be considered traditional(tradlining).Gibbon lines can be set lower to the ground due to its low stretch and appeals to any one new to the sport and looking for a challenge. The two inch line is also a great cross-trainer for the 1 inch.To pull this line tight, one only has to use a ratchet. The sportlines have a long line of tricks to go with it, and a huge following. Gibbon has been gaining momentum in popularity by establishing major competition circuits in Europe and throughout the US. Gibbon lines has definitely raised the bar several times over in the sport of tricklining. The line locker is the best way to keep knots out of your system and to keep the line as flat as possible with no twists. The fact that this design is knot- less, which increases the strength of your line and is easy to take apart after it has been under tension makes it a perfect way to set up your line. Slacklining is and can always be a fun and exciting sport.You slack at your own risk, and you must consider your own safety as well as the ones around you. Know your limits and work together as a team to ensure the ability to slackline safely, responsibly and ethically. You should always check your gear before, during and after each time you set up to slackline. When you check your setup, there are three different areas you should look at which does not take vary long. 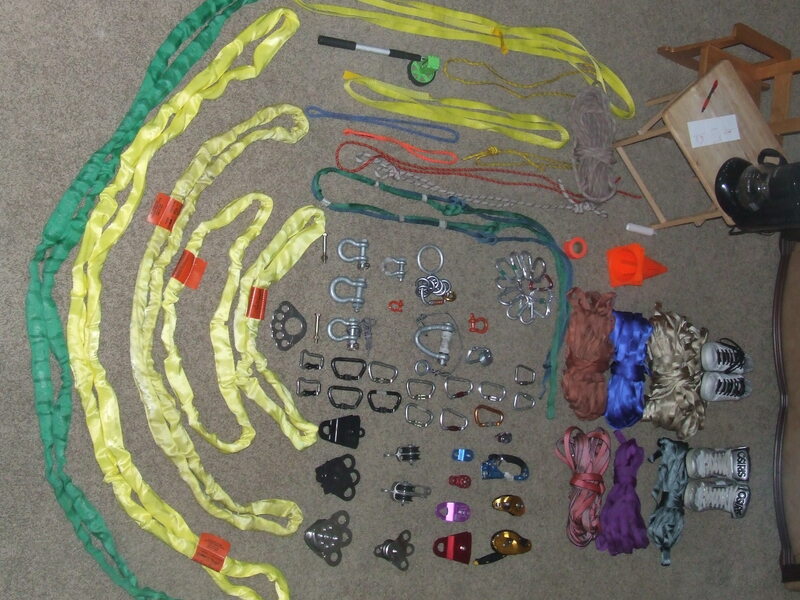 The areas are, the tubular webbing, the carabiners, and the Anchor. Look and feel the webbing for nicks, abrasions, and burns. Recommended locking carabiners for all setups, the potential for bending is possible. When using locking carabiners always check to see if they are in the locked position. The vibration within the line could lead to the screw lock coming unlocked. When creating an anchor there are three different ways by trees, rocks and A-frames. Always wrap your trees with a protective martial, for the trees sake as well as you anchor the tension on the tree will be high, and likely cut into the material over time. Only when you know what you are doing should you set up on rock. When building A-frames you can refer to the Slacklinevisionswordpress blog site for in depth directions. Take caution for those that are around you, leave no trace, check double check and check again when rigging. Protect your anchors and webbing from the elements, and to remember that anything is possible through proper thought! Now spread the word about this new emerging sport of balance and create your own vision of slackline! It was only a matter of time before the sport of slackline and yoga were infused with one another, that creates a style unto its own. The benefits of combining the two is in the way that slacklining works the mind and body together, in a way where in order to stay balanced one must truly feel the environment, through breathing, remaining focused and body position. 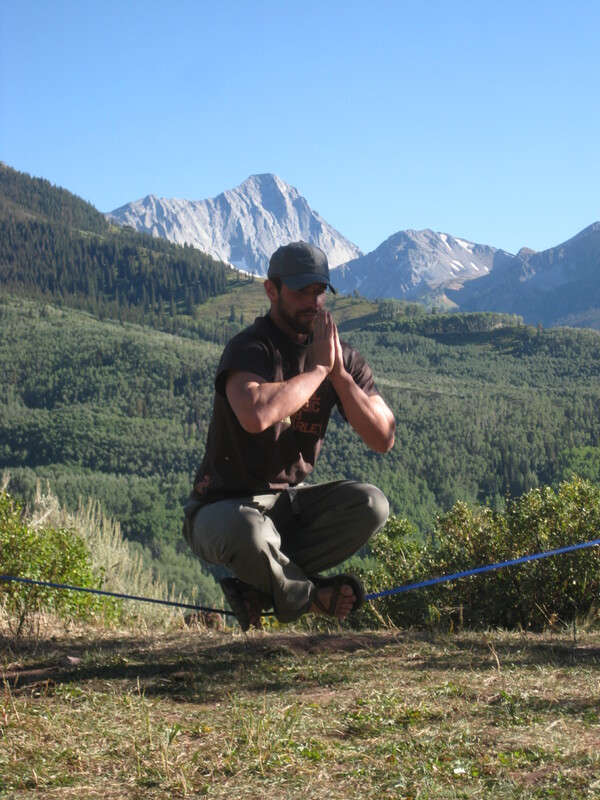 Though yoga on the slackline might require a bit more focus on the slackline vs. flat ground, like anything else, it takes a little practice and patience. So from the beginner poses to the most difficult pose on the line, there is something for everybody. 1. Do I need to where shoes or should I go bare foot? Answer- When you first begin slacklining, it might be best to start out bare foot. If you already spent some time on the slackline with shoes then stick to the shoes, theory behind it, stay with what you know. Starting off bare foot can give your feet a better sense of connection with the line. 2. What should I look for in a shoe? Answer- Most shoes to start with will do the job, but as you progress and can afford it, a nice pair of slackline shoes will help. Buying shoes is a personal choice, but when it comes to buying a pair for slacklining there is a lot to consider. There are three things that I would suggest when buying a shoe for slacklining. 1- buy a pair of shoes with a flat sole rather than one with traction on the bottom. The smooth surface cultivates greater feeling when walking, doing tricks, and making consecutive turns on the line. 2. Another great feature a shoe could have is a tongue. A thick high tongue on a shoe will not only protect your ankle when doing tricks, it will also help you push past barriers that you might be stuck at. 3- The most important thing to remember when purchasing a pair of shoes is to buy something that is comfortable . 3. What is the difference between the one inch line and the two inch line? Answer- Great question, when comparing the two you could say the difference would be the same found in the climbing world with the taditional climbing compared to sport climbing. The traditional being the one inch, and the sport being the 2 inch gibbons. 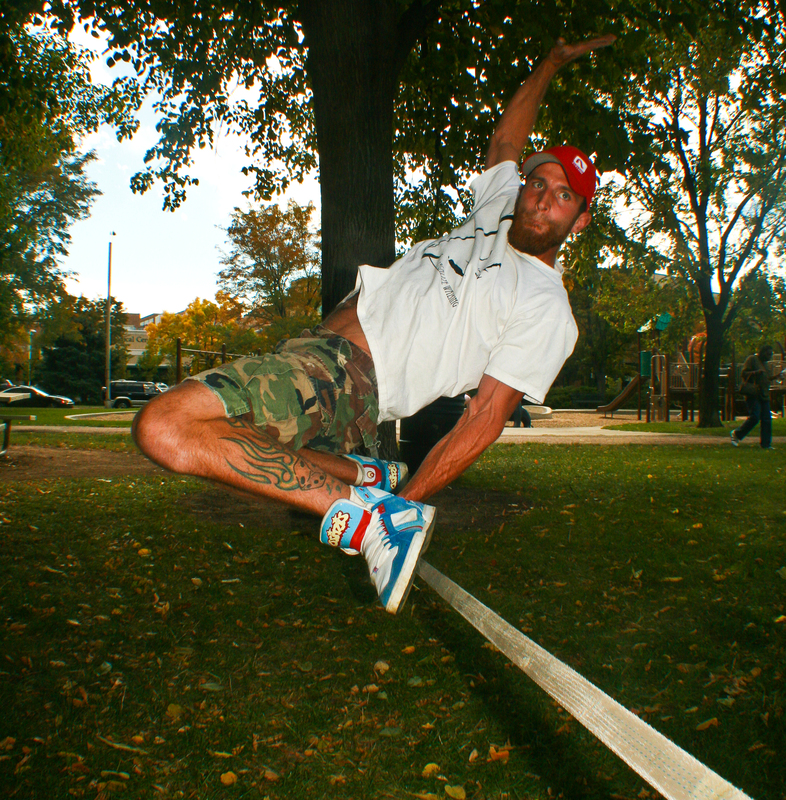 The traditional slackline has been around since the late 70s and sport slacklining came out in 2007. The two kinds of slacklining, though different in feel, and style, one will find that the principals for maintaining ones balance are similar. Both traditional slacklining and sport slacklining each have there own unique challenges. The Gibbons two inch line is a little easier to set up because of its lower stretch and using a ratchet system to pull tight with. while the set up on the traditional slackline takes a bit more effort. With both forms of slackline at your disposal, I would recommend that you try both to find out what your preference is. 4. Where can I find someone to slackline with? Answer- Nowadays it shouldn’t be too hard to find a fellow slacker. There are many different groups that cater to the ever growing slackline community. There are also groups online that one could follow including this Slackline Visions blog. 5. What should I be concerned with when I start slacklining? Answer- When you first start to slackline it can be quite frustrating. Unlike most sports that you might be able to pick up enough to enjoy it on a beginner level, slacklining takes a little more time and patience. In your first half hour to hour on the slackline your strategy should be time spent on the line, and not distance traveled. The biggest challenge while slacklining is in the head space, if one cannot remain focused and relaxed on the line, one wont be able to find the right coordination through the mind and body to stay on for any length of time, let alone take any steps. When slacklining, the many things going on with the mind and body can be overwhelming to say the least. One way to contradict such a feeling is to breathe and to let the oxygen flow. Remember to be patient and that a solid foundation to slacklining is key to your progression in this unique sport of balance. 6. Do girls slackline too? Answer- The answer is absolutely! The number of women who are coming on to the slackline scene are growing all the time. I have been fortunate enough to slackline with some of the worlds best female slackliners and teach slacklining to a womens rock climbing class at a college several times throughout the year. When teaching slacklining to females, I have noticed a degree of intimidation. The majority of the women that I have taught actually perform better than the guys I have taught. The biggest thing that sets the two genders apart is the patience to learn how to balance taking smaller steps, rather than most guys with ambitions to start walking, doing tricks, and jumping on the line for their first time.Women also have a lower center of gravity than men to take advantage of. When it comes to slacklining there is no boundaries as to who can do it or how old you are. During my travels teaching slacklining I have encountered many walks of life men, women, young and old, everyone deserves the chance to try slacklining. Like anything in life don’t let intimidation get in the way of you discovering yourself! 7. What is the highest slackline? Answer- The highest slackline on record was walked by Christian Schou on August 3, 2006 in Kjerag, Norway. The slackline was 1,000metres (3,281 ft) high. The longest highline was walked by none other than Andy Lewis on September 10, 2010 in Moab, UT, the line was 340ft long. 8. What is the longest slackline? 9. What is the highest longline? Answer- The highest longline Is 340ft long and 400ft high Walked by none other than Andy Lewis in Moab UT. 10. Where should I get the material, Home Depot? 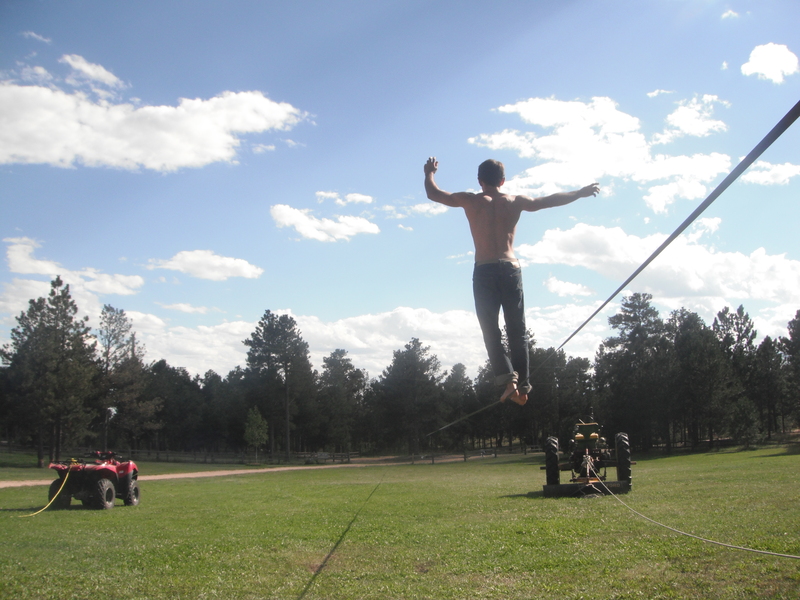 Answer- When considering slacklining, your next decision would be, where do I buy my slacklining equipment? There are many different places that you can find material in order for you to build your slackline set up or there are packaged setups that you can buy that will have everything you need. As you progress on the slackline your need for individual equipment will increase. When that time comes make sure that everything you purchase is from a business sensitive to the climbing world and has a rating of how durable the material is. Do not buy your equipment at the local hardware store. At Slackline Visions we do have traditional slackline kits available for purchase. 11. What does KN stand for? Answer- KN is an abbreviation for a kilonewton. Kilonewtons are often used for stating safety holding values of fasteners, anchors and more in the building industry. 1 KN equals 225lbs. So if your carabiner shows 22Kn then that means that the carabiners rating is 4950lbs. 12. Can slacklining help me as an athlete?